José Carioca: When you go to Baia, my friend, you'll never return! José Carioca: [laughing] This Donald! Did you ever see such a fast worker? Narrator: We were off with the speed of a bullet! We flew down the track like the wind! Every gaucho was, uh... And meanwhile, Burrito and I were, uh, uh, jockeying for position. Psst. Gauchito! They went that way. Narrator: No wonder they laughed. I didn't even look like a jockey. Hey! Gauchito! Narrator: Come on, look like a jockey! Panchito: Did you know that the history Mexico is in her flag? Oh, yes. You see, many hundreds of years ago, the god of the Aztecs commanded them to build a big city where they would find an eagle destroying a serpent. But when they find this eagle, he was sitting on a cactus, on top of a rock, way out in the middle of a lake. Caramba, to build a city here would be almost impossible. But they built and built and built some more, until today, believe or not, the lake is full of Mexico City. José Carioca: [to Donald] As you Americans say, what's cooking? Donald Duck: Joe Carioca! Well, I'll be doggoned! José Carioca: Imagining, meeting me here! Donald, have you ever been to Baia, no? Donald Duck: No, I haven't. Donald Duck: [meeting some women on Acapulco Beach] Hello, my sweet little bathing beauties! Jane: [reading advertisement for a new nanny] "Wanted: a nanny for two adorable children." George Banks: Adorable. Well that's debatable, I must say. George Banks: Well of all the ridiculous...! Jane: Take us on outings, give us treats, sing songs, bring sweets. Never be cross or cruel. Never give us castor oil or gruel. Love us as a son and daughter, and never smell of barley water. Michael: I put that in, too! Jane, Michael: Jane and Michael Banks! Panchito: [talking about Las Posadas] This custom takes place on each of the nine days before Christmas. Each evening, the children gather at the village church and form a procession, symbolizing the journey of Mary and Joseph from Nazareth to Bethlehem. The little ones carry images of the saints from house to house, singing a plea for shelter, or posadas. A reply comes from within, "No posada, no shelter." Looking sad and downhearted, they try again. But the reply is still the same: "No shelter, no posada." They repeat the song time after time, and always they are refused, until at last they finally reach a house, and the door is open. "Come in, come in, holy pilgrims. This humble home is yours." And now, Mary and Joseph have found shelter at last. Then the rejoicing begins, the feasting, the celebrating, and finally, the biggest surprise of all, breaking the piñata. José Carioca: What do you feel about Baia? Tell me the truth. Donald Duck: Oh, swell! Marvelous! Romance! José Carioca: Sim, senhor. Voce e um grande pirata. Or, as you say, you are a wolf! Narrator: By the way, amigo, did you know that some birds are skilled craftsmen? Donald Duck: Uh-uh, is that so? Narrator: [during footage of a Marrequito building a nest, by piling up sticks and twigs on top of each other] Yes, quite a builder is the little Marrequito. Narrator: ... well, almost anything. Narrator: What a time two toucans have making love. When they're beak-to-beak, they can't get cheek-to-cheek, because when one toucan turns his head, only one toucan can. José Carioca: You kill my head! Narrator: [on movie] Aves raras. Narrator: Si, señor. That means "strange birds". Donald Duck: Oh, sure, sure! I know! Birds! Narrator: Yes, amigo, your feathered cousins. You know, Donald, you have more relatives here than there are coffee beans in Brazil. Panchito: Hey, Donald, you are what they say "off the cob". You know, corny. Panchito: Some fun, eh, kid? Narrator: Now, the best place to hunt the wild ostrich is out on the wide open plains, on the broad, flat land of the... Flat land? Say, what am I doing here? Oh, now I remember! This day, I was hunting for condor birds high up in the mountains. While looking around for the condors, I climbed to the top of a rock. No, come to think of it, it was a tree. Let's see, maybe it was a rock after all, although I could swear it was a tree. Oh, what's the difference? Let it go, let it go. Donald Duck: [referring to a piñata] What's this? Panchito: This is your gift from Mexico, Donald: a piñata! Donald Duck: Oh, boy, oh, boy, a piñata!... What's a piñata? Panchito: A piñata is full of surprises. Presents. It's the very spirit of Christmas. Panchito: [laughing] Oh, no, no, Donald! For goodness sake, not "Jingle Bells". In Mexico, they sing "Las Posadas". Professor Holloway: And so, as the warm, tropical sinks slowly in the west, we leave little Pablo, a bird in paradise, a picture of health in his new coat of tan. He should be the happiest penguin in the world. Narrator: [laughs] Never satisfied. Well, that's human nature for you, even if you're a penguin. Donald Duck: You're absolutely right. Panchito: [seeing Donald and José for this first time] Aha, my friends! ¡Bienvenidos, cuentos! Panchito: Welcome to Mexico! Son of a gun, it's a pleasure to see such fine gentlemen in Mexico. 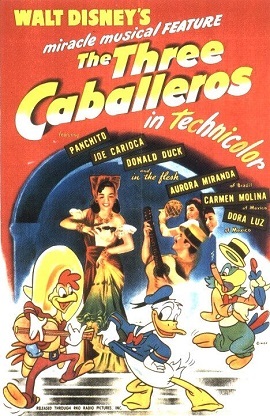 Panchito: [laughs] Caramba! Now we're three gay caballeros. José Carioca: Have you been to Baia, Donald? José Carioca: Well, let's go! José Carioca: But tell me, Donald, have you ever been to Baia? José Carioca: No? Oh, I am so sorry for you. Ah, Baia. It is like a song in my heart. A song with love and beautiful memories. Que saudades que eu tenho. Ah, Baia. I close my eyes, and I can see it now. I can see the beautiful twilight in the sky. I can feel the breeze from the bay. And I can hear the music, the music of Baia.